We're fascinated by businesses born of necessity. We've written in the past about Snapdragon and Werner, two of the many Pacific Northwest paddlesport companies begun by enthusiastic paddlers who needed gear that wasn't readily available. But the truth is, most of today's best-known kayak-related companies began as cottage industries--a phenomenon well portrayed in Kent Ford's film, The Call of the River. 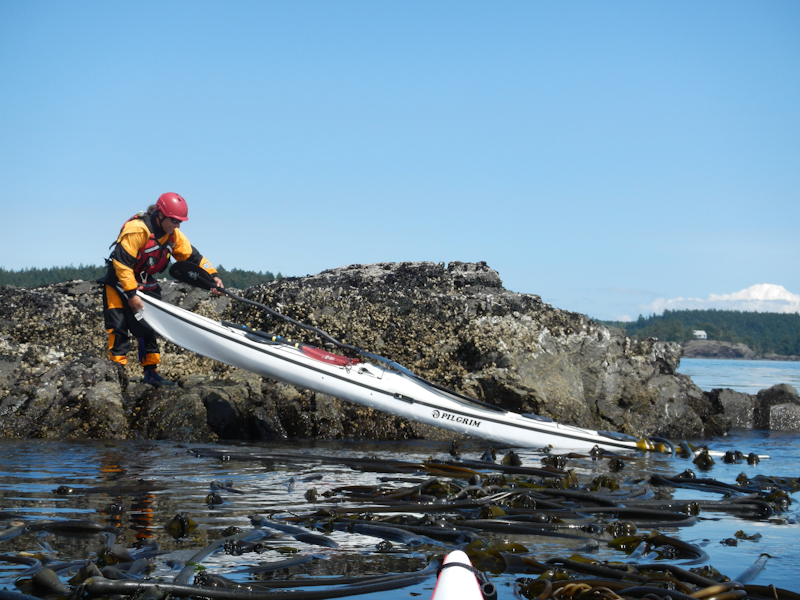 Taking David up on the claim, "If you break it, Alta Kayak can fix it!" Yesterday, we dropped in on David Thompson, founder of Alta Kayak, a custom outfitting company on Orcas Island. 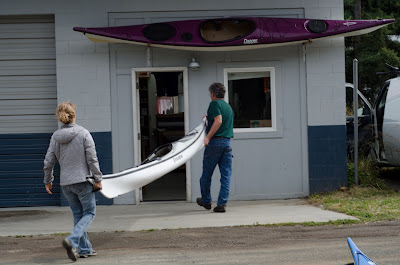 We brought a boat for him to repair ("If you break it, Alta Kayak can fix it!" his website promises) and hung around to look at his current projects. 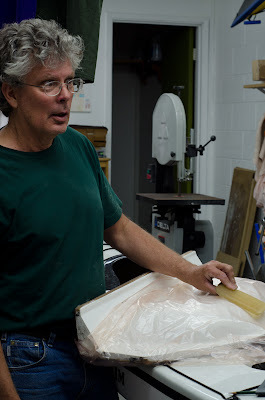 David bills himself as a designer and craftsman--talents that predate his work on human-powered crafts. He began working with his hands at the age of 14, helping his grandfather do stonemasonry. He did bodywork on airplanes in the armed services, then worked in boiler repair and construction. Six years ago, while living in Montana, he decided to apply his skills at building and repairing things to kayaks; four years later, he moved to Orcas, which offered the perfect combination of paddling opportunities and performance sea kayakers -- the kind of people who really care about customizing their boats. 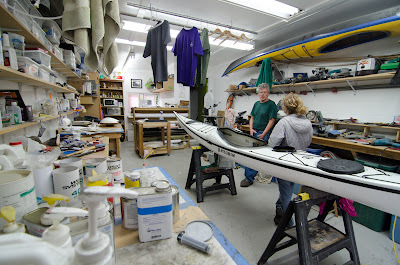 David Thompson in his shop. Today he specializes in custom seats to replace the ones that come from the factory. 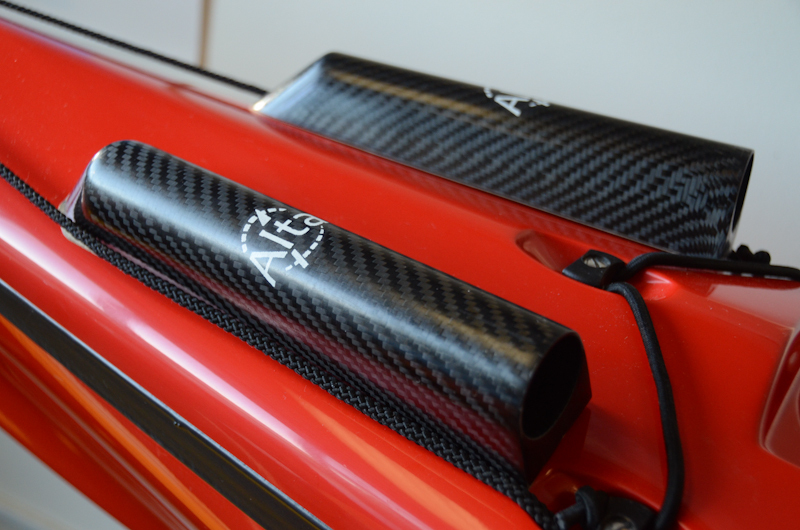 He creates some of them to solve specific problems, such as lower back pain, tailbone pressure or leg cramps; some to suit specific preferences for seats of a particular height, width or shape; and some for performance paddlers who prefer a composite seat to a plastic or foam one. Each seat is made to order, built by hand for a specific person and boat. 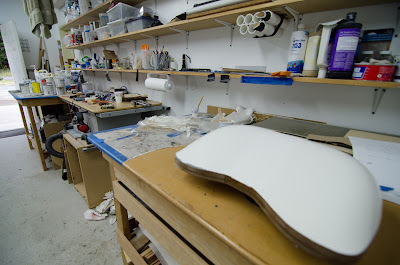 One of David's hand-built molds for a kayak seat. People learn about his seats mostly through word of mouth or by seeing them in other people's boats. If they can come to Orcas, they can buy a custom fiberglass seat for $150, or a carbon fiber seat for $200, and David will install it for $50. If coming here isn't an option, he can ship the seat and all the parts required for installation. Rolls of carbon fiber, fiberglass and other material. One of David's recent innovations is a carbon-fiber paddle holder that's bolted to the deck ($200 plus $50 for installation). And he's working on a deck compass light that doesn't interfere with night vision. David's paddle holders are sleek and secure. 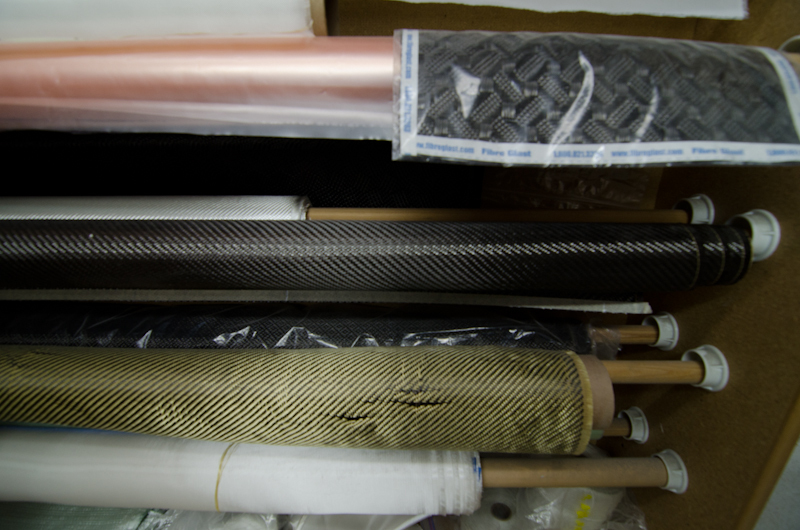 Between projects, David still performs a fair number of boat repairs and keel strip installations. The best part of his job, he says, is being able to create things, and the positive response of the people who buy them. That and not punching a clock. 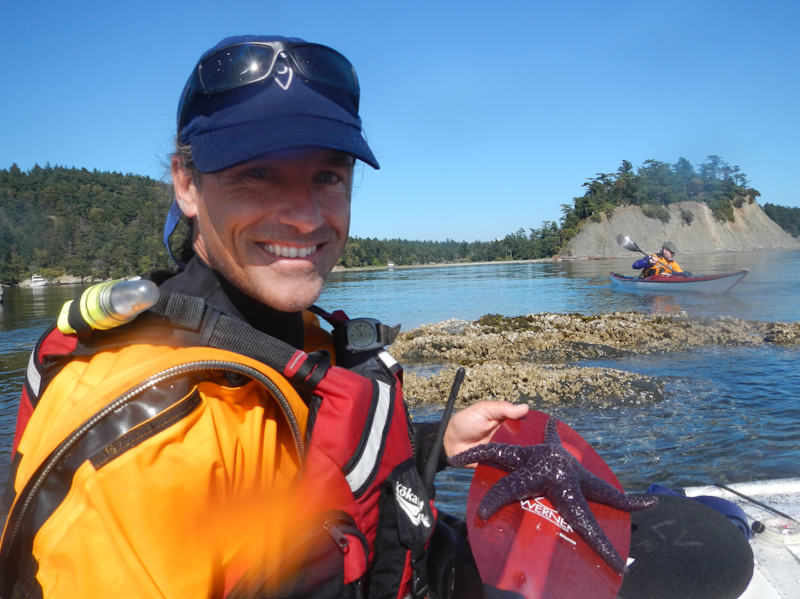 We have to think that no small part of his job satisfaction also has to be living in one of the best paddling locations in the nation. That and getting out on the water as often as he can. 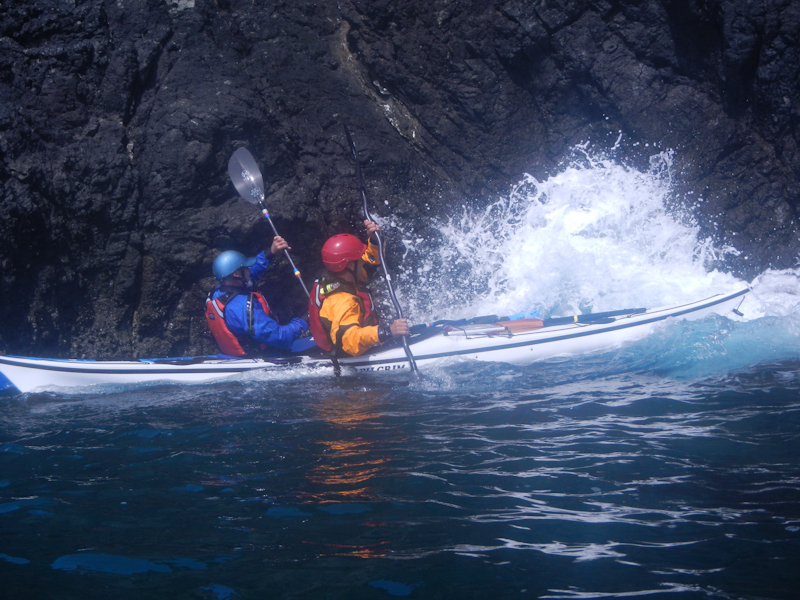 Seth and Sharon in a tidal race in the San Juan Channel. Paddling on the Great Lakes can be challenging at times. Strong winds generate large, steep waves; hard break walls produce chaotic clapotis. But we don't have tides, so many ocean features are less familiar to us: massive eddy lines, whirlpools, overfalls, and the complications of navigating in current. Current creates fun features on the ocean. We've enjoyed seeking out challenging water on the Great Lakes as well as on rivers, and we've trusted that the skills we've developed would translate well to the ocean environment. 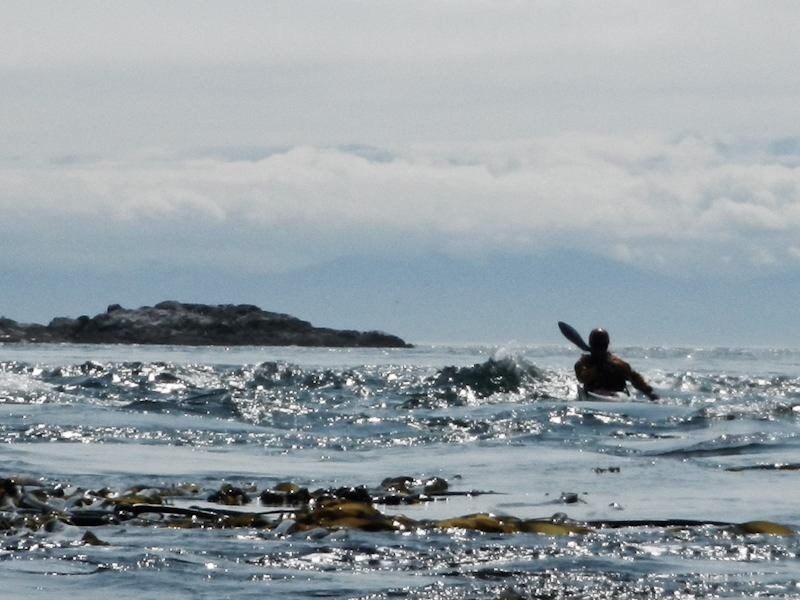 But there was only one way to be sure: get out to the coast and paddle. Alec prepares to "speed launch" off a barnacle-encrusted rock. It works as well here as anywhere. Over the past two weeks, we've practiced doing self and assisted rescues in strong current, rolling in whirlpools, maneuvering around rocks and ledges, extracting swimmers from craggy slots, and surfing in tide races. Leon and Alec control their boats in a slot. 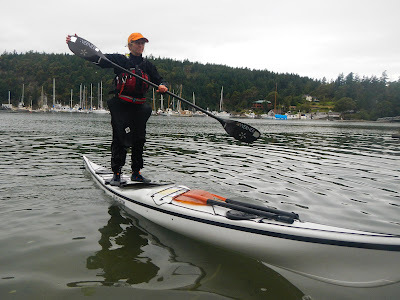 Sharon demonstrates an essential flat-water skill. 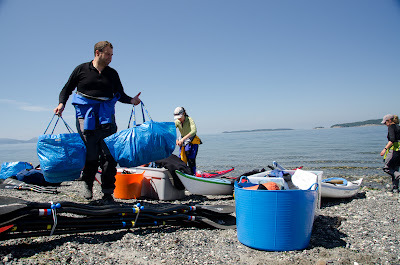 Preparing for a trip: Paddling! 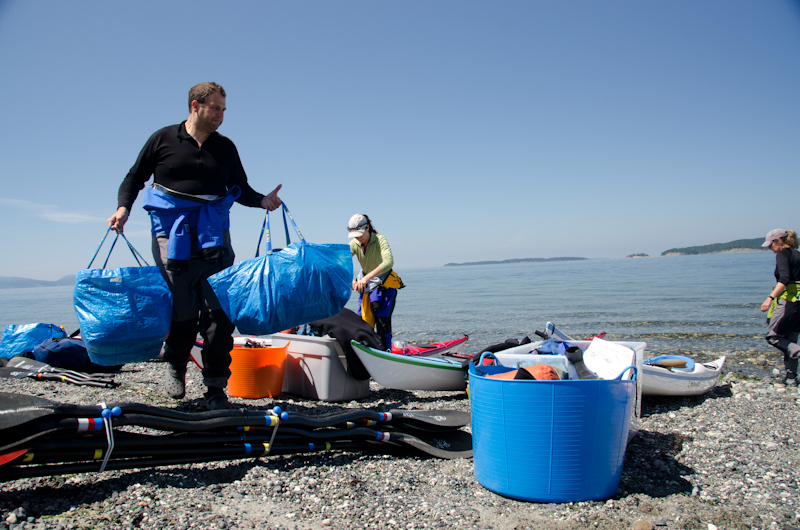 We spent several weeks assembling all the gear and supplies we'll need for our upcoming trip along the shoreline of Pukaskwa National Park and Superior Highlands in Canada. But all the planning and preparation would be for naught if we didn't also get out and paddle. 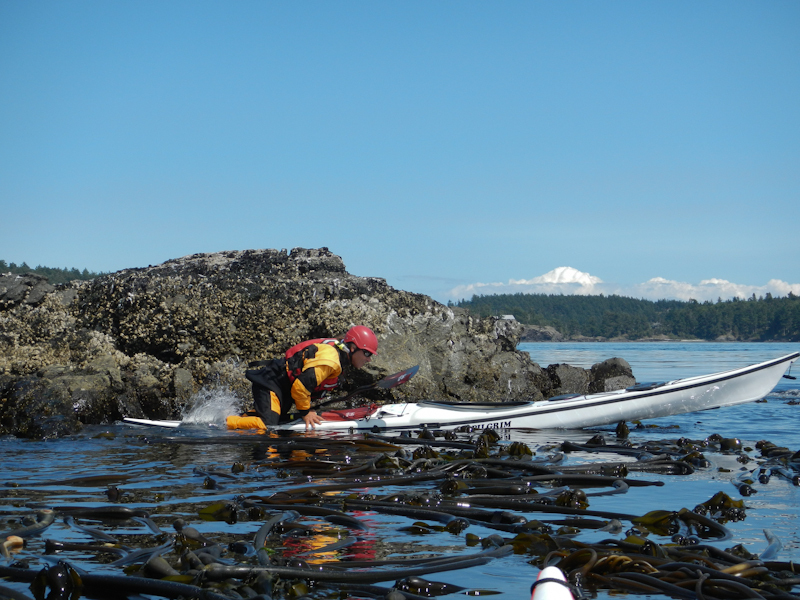 We're doing just that this month in the San Juan Islands in Washington state, where we're coaching some courses for Body Boat Blade International and paddling in this beautiful, dynamic location. 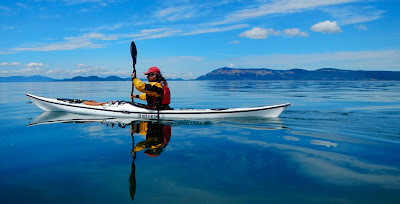 Alec paddling on a calm and clear day. OK, so being here isn't solely trip preparation. 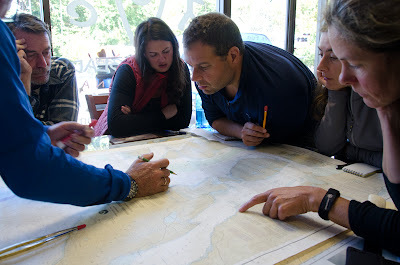 It's actually an opportunity for us, as Great Lakes paddlers, to develop our knowledge of tides and currents and how they affect trip planning and ocean features, to work on our navigation skills, and to learn from Shawna Franklin and Leon Somme, two of our coaching mentors. 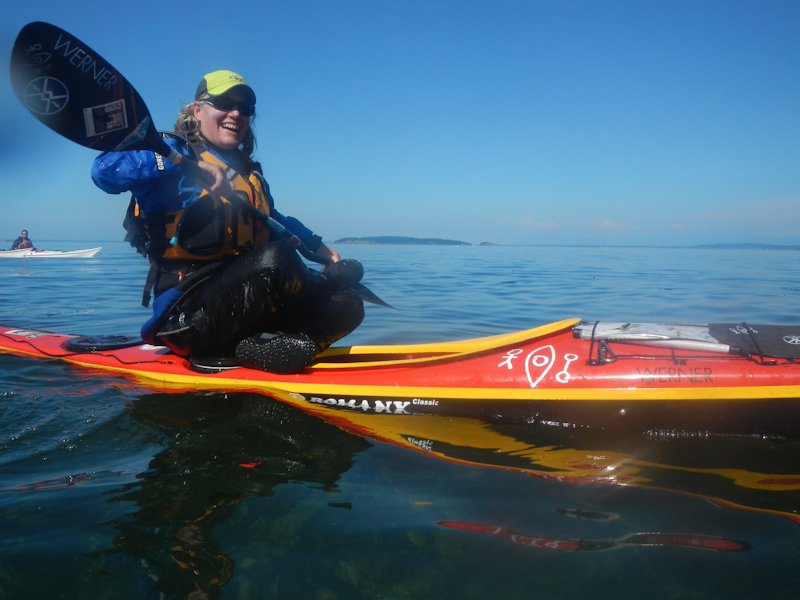 Shawna, demonstrating a yoga pose atop a kayak. Being here is not particularly conducive to blogging, however. Our only access to the internet is at the shop, which isn't where we're spending most of our time. Rather, we're out on the water as often as possible. We began our time here assisting with a five-day kayak camp, a "learning vacation" for paddlers with some prior experience that covers paddling technique, rescues, rolling, tides and currents, navigation and risk assessment. 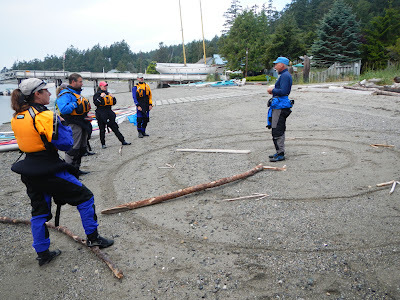 ...before heading out on the water to work on strokes, maneuvers and rescues. 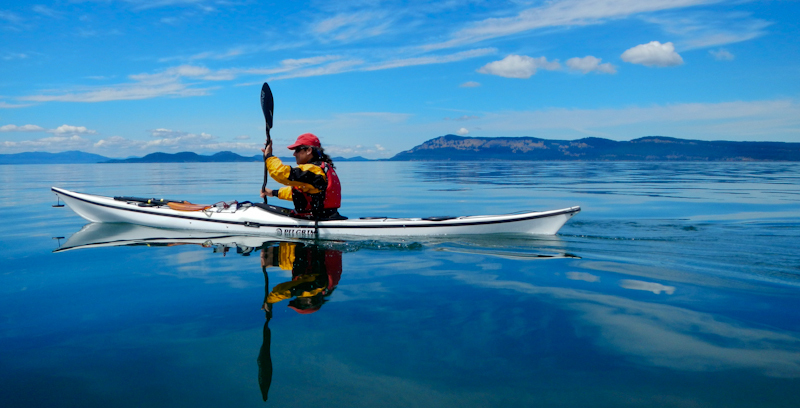 The course culminates in an overnight trip that participants plan and execute, complete with a cookout and a night paddle in the bioluminescent plankton Noctiluca scintillans. 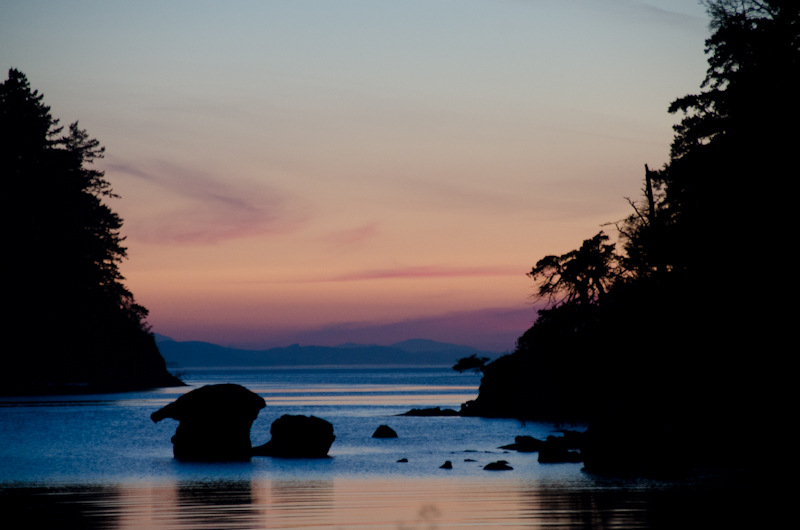 Sunset at Sucia Island, where we spent the night. The goal of the course is to provide participants with the core skills they need to safely embark on their own trips. 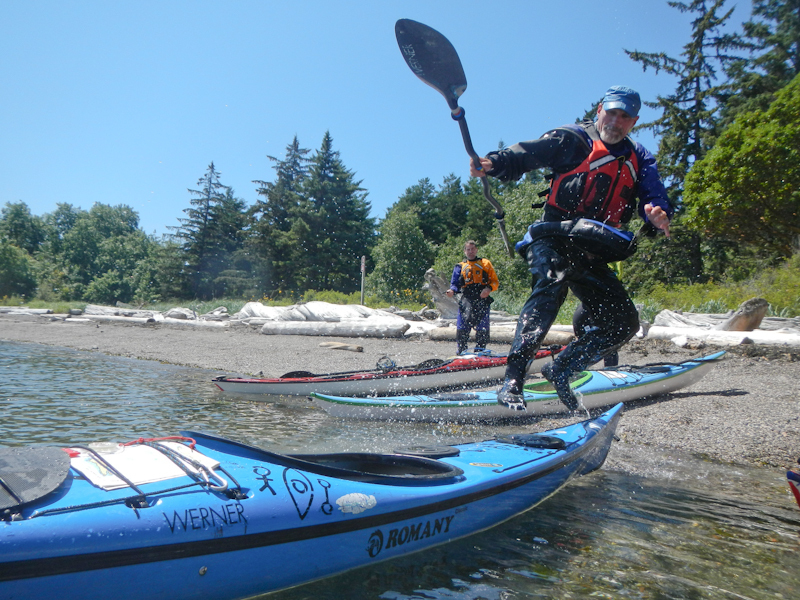 As with all courses at Body Boat Blade, the aim is to create independent paddlers. 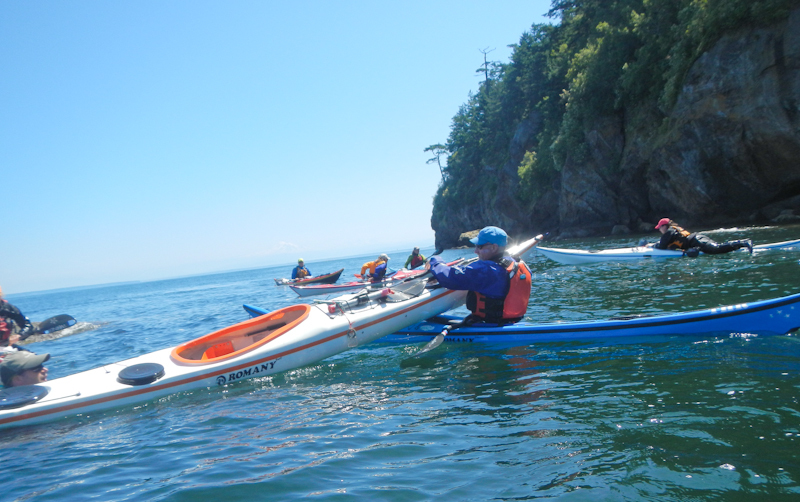 Judging by the paddling these participants set off to do after the class ended, and the thoughtful way they approached their plans, the five-day camp attained this objective.